At this point you can usually just “size to fit” and Interface Builder will use its knowledge of the control’s class, and that class’s ability to size itself to suit its content. Or, if you’re using Auto Layout, it might mean that you need to ask Interface Builder to update the items’s frame, allowing Auto Layout to essentially size to fit for you. In this case however I have a conundrum: both “size to fit” and AutoLayout insist this is the proper size and placement for the control, yet Interface Builder is still convinced the control will clip its content (the text of the menu item title). What happens if I naively attempt to increase the width of the popup button? The clipping area is gone, as Interface Builder is convinced the button is now wide enough, but that width is in conflict with what Auto Layout is convinced is the right width. I can’t win: if I let Auto Layout have it’s way, I get an annoying clipping notice. If I let the clipping notice have its way, Auto Layout throws a fit. One workaround, when working with Auto Layout, is to provide a bogus constraint that forces the width of the popup button to the width that I’ve manually imposed. 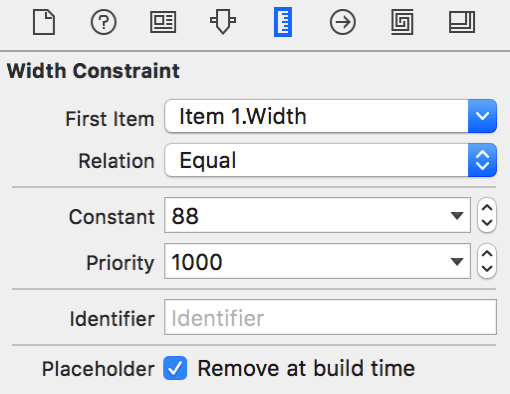 By setting it to “Remove at Build Time” it should not have any effect on the behavior of your interface, except in Xcode itself. See that empty “Identifier” field? I have actually taken advantage of that field as an opportunity to add a memo to myself for future reference: “Work around bug 25938”. This references my internal bug tracking the issue, so I can re-acquaint myself with the problem if I find myself wondering about this bogus constraint in the future. It seems to me the bug here is either that NSPopUpButton sizes to fit at too narrow a size, technically causing “clipping” of its subviews. 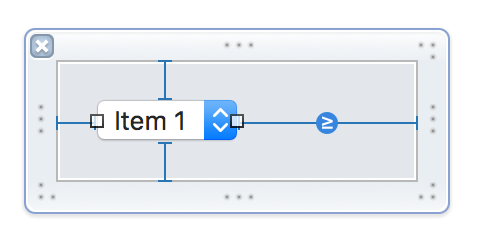 Alternatively, Interface Builder’s deduction of a view’s size causing clipping has some bug in it. Either way, I’ve filed the issue as Radar #30222922. Update, January 28, 2017: Thanks to a tweet from Mark Lilback, I discovered the notice about clipping is a bit less pervasive than I thought. The notice only seems to appear when Xcode has the xib file actively open for editing with Interface Builder. What this means practically is that you have to click on the xib file at some point and have the editor appear for it, before the notice appears. It also means that if you cause Xcode to close the file for editing, the notice disappears. You can close any file in Xcode by focusing on its editor and then selecting File -> “Close <filename>”, or by pressing Cmd-Ctrl-W. I have always found these kinds of notices in Xcode to be somewhat unpredictable. The fact that the file has to be actively opened for editing, combined with the fact that files remain open in Xcode after their editor is visually swapped out, explains most of the apparent inconsistencies I’ve seen. For years I have used Jenkins to manage all my automated Mac and iOS builds. I have jobs set up to build and release apps “on demand,” as well as integration builds that kick off whenever a change is made to a pertinent source code repository. For years I have also put up with a small but vexing nuisance that when something goes wrong with a build, I have to search in the most unlikely place for pertinent informational messages printed by my build scripts: at the very bottom of the log. I had chalked it up for so long to being a nuanced Jenkins bug, that I never took the time to get down to basics and really unwrap what is going on. Today, I did that, and also came up with an easy solution. I use a custom script to drive the whole process for each of my automated builds. This script is responsible for printing diagnostic information and for invoking other tools (such as xcodebuild) to get the actual work of building, testing, and uploading done. The problem with the misplaced log lines in my console output has to do with a feature of the scripting language I use to drive the process: standard output buffering. I use Python, but the problem could also affect you if you use a language such as Ruby to drive your automation. The message from the “ls” subprocess prints right away, but Python buffers the output until it’s done running, leading a nonsensical printing of the “start” and “end” messages after the job is completely done. This is a small annoyance in this example, but in a real-world scenario it means that the pertinent xcodebuild invocation, which I print to the console before calling, will now show up where it belongs in the console log, making it much easier for me to reason about the behavior of my automated builds when they aren’t working as they should.